On May 25, 1969, United Artists released the film Midnight Cowboy, starring Jon Voight (Texas transplant Joe Buck) and Dustin Hoffman (the sleazy Ratso Rizzo) as street hustlers in NYC. It was the first studio film to receive an X-rating (the studio refused to edit anything out), and it became the first X-rated movie to be nominated and win a Best Picture Oscar (A Clockwork Orange and Last Tango in Paris followed suit with X-rated nominations). Hoffman and Voight were also nominated for Oscars, and screenwriter Waldo Salt and director John Schlesinger ended up winning gold statuettes for the movie. After the movie became a success, the MPAA demoted its rating to an R.
Based on the novel by James Leo Herlihy, the film featured controversial gay intonations, yet it grossed $44 million—about $200 million by today’s standards. The movie saved the careers of its actors, producers, and Salt, who had been blacklisted and fallen on hard times. It also produced a hit song, Harry Nilsson’s “Everybody’s Talkin’.” Here are 15 facts about the landmark film. 1. JOHN SCHLESINGER WAS RELUCTANT TO HIRE DUSTIN HOFFMAN. Like everybody else, the filmmakers associated Dustin Hoffman with Benjamin Braddock, the clean-cut twentysomething he played in The Graduate. “The truth was, I saw The Graduate as a setback, because I was determined not to be a star,” Hoffman told the Los Angeles Times. Hoffman was doing Off Broadway performances during the casting of Midnight Cowboy, so Schlesinger checked him out in a play. Hoffman frequented an automat with fellow thespians Gene Hackman and Robert Duvall; one night Hoffman showed up there with a scruffy beard, disheveled clothes, and a Bowery accent. Schlesinger said to Hoffman, “Why Dustin, you do fit right in,” and he got the part. 2. MIKE NICHOLS TRIED TO TALK HOFFMAN OUT OF DOING THE MOVIE. 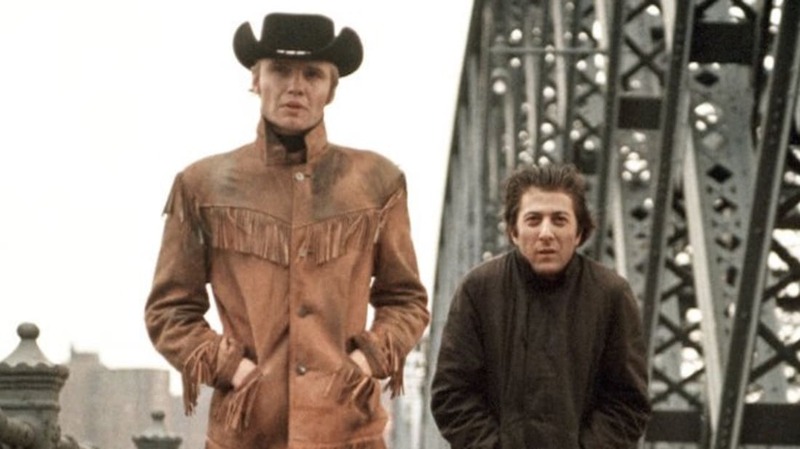 Hot off the heels of Mike Nichols’ The Graduate, Hoffman could’ve kept his romantic lead image up, but instead he opted to take a supporting part in Midnight Cowboy. “Mike Nichols, in fact, called me up,” Hoffman told Peter Travers. “And he says, ‘Are you crazy?’ He says, ‘I made you a star. This is an ugly character. It’s a supporting part to Jon Voight.’ He says, ‘What are you doing? Why are you sabotaging?’” But Hoffman stuck to his guns and took the role. “I love the fact I was trying to remain a character actor and that was my desire,” he said. 3. VOIGHT WAS CAST ONLY AFTER THE ORIGINAL ACTOR WAS FIRED. 4. VOIGHT WORKED FOR SCALE. Voight was so desperate to play Joe Buck that he worked for scale: “‘Tell them I'll do this part for nothing,’” Voight recalled to The Telegraph. “They took me at my word, and they gave me minimum for Midnight Cowboy.” At the end of the shoot, they sent him a $14.73 bill for meals on the last day of filming. 5. HOFFMAN THOUGHT THE MOVIE WOULD RUIN HIS CAREER. 6. VOIGHT KNEW THE FILM WAS DESTINED TO BECOME A CLASSIC. 7. VOIGHT AND HOFFMAN WERE COMPETITIVE WITH EACH OTHER. 8. HOFFMAN PLACED PEBBLES IN HIS SHOE TO ACQUIRE RATSO’S LIMP. 9. SCHLESINGER OUTED HIMSELF DURING FILMING OF THE MOVIE. 10. THE FAMOUS “I’M WALKIN’ HERE” LINE WAS IMPROVISED. 11. HOFFMAN THREW UP ON SET WHILE TRYING TO COUGH. 12. SCHLESINGER DIDN’T THINK ANYBODY WOULD MAKE THE MOVIE TODAY. In 1994, the director found himself at a dinner party with a studio executive. “I said, ‘If I brought you a story about this dishwasher from Texas who goes to New York dressed as a cowboy to fulfill his fantasy of living off rich women, doesn’t, is desperate, meets a crippled consumptive who later pisses his pants and dies on a bus, would you—’ and he said, ‘I’d show you the door,’” Vanity Fair reported in 2000. 13. THE SUNDANCE FILM ME AND EARL AND THE DYING GIRL PAYS TRIBUTE TO MIDNIGHT COWBOY. 14. THERE’S A SPEAKEASY BAR IN AUSTIN NAMED AFTER THE FILM. 15. A CHICAGO THEATER IS TURNING IT INTO A STAGE PRODUCTION. Chicago’s Lifeline Theatre puts on a lot of literary adaptations, and this February they begin previews for Midnight Cowboy, based on the book. This will be the world premiere adaptation of the novel. The show runs through April 10.